Product Name: SILENT HILL 3 / Robbie the Rabbit 1/6 Scale Statue, Blue Ver. 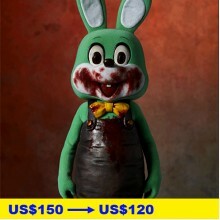 This is the blue version of "Robbie the Rabbit", the mascot of "Silent Hill". A lot of Blue Robbie the Rabbit appear in the bonus movie “兎 usagi” supervised by the character creator Usagi Tanaka. Also included is a yellow chainsaw weapon which makes you laugh in this horror mania, with the words “Your Fingerpost” written across the blade.